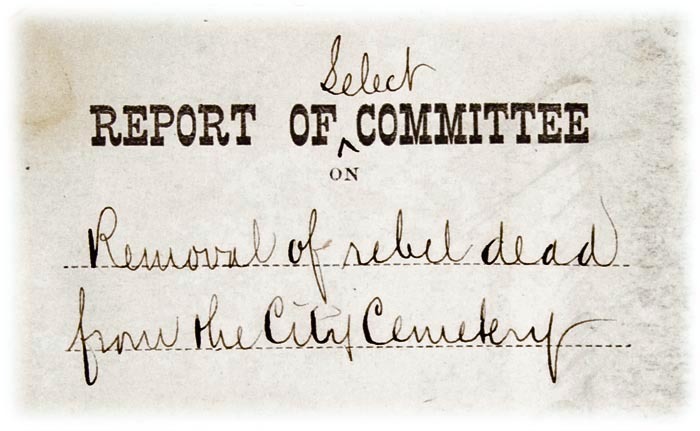 Unlike the other aspects of this Hidden Truths project, research has been conducted and published regarding the City Cemetery's potter's field being used as a repository for the Confederate soldiers who died while prisoners of war at Chicago's Camp Douglas. The book, To Die in Chicago: Confederate Prisoners at Camp Douglas, 1862–1865, by George Levy, is a detailed account of the camp in all its overcrowded and disorganized horror. The film documentary, Eighty Acres of Hell, presented on Arts and Entertainment Television's History Channel, also gives a thorough account of the history of the camp, which was located near today's 31st Street and Cottage Grove in Chicago. In the Some Numbers section, above, I defer to George Levy's research and cite it accordingly. There are varying accounts of the number of men who died at Camp Douglas who were buried in the City Cemetery, and how many of those interred were then moved to Oakwoods Cemetery.